As I was traveling around the country in January and March the decline in producer attitudes or sentiment toward the agricultural economy was palpable. Unfortunately, I didn’t have a good way to measure this or formally take a poll of attitudes and sentiment. Well, that is one problem we won’t have to worry about anymore. 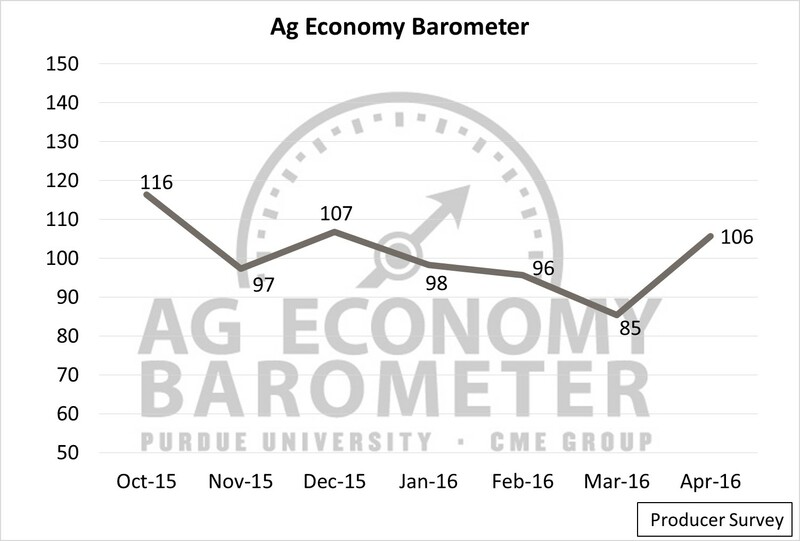 Purdue’s Center for Commercial Agriculture and the CME Group recently unveiled their newly developed Ag Economy Barometer and it formally takes a reading on attitudes toward economic conditions in the sector. It’s not often that we get new data sources on the ag economy and I am quite excited to see how ag sentiment evolves over time. 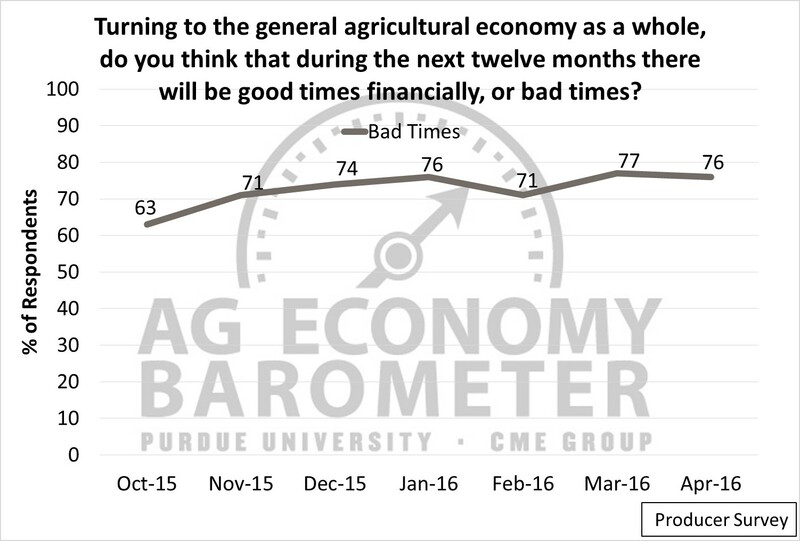 The Ag Economy Barometer is built on a monthly survey of agricultural producers and seeks to understand how farmers perceive current and future conditions in the agricultural economy. It builds the index off of a series of simple questions about the farm economy. Basically, these questions seek to understand producer attitudes toward the current and future conditions in the general ag economy, farm financial conditions, and the ag investment climate. The nationwide survey also asks a series of questions about commodity price expectations and other interesting topics. You can find the details of the survey methodology (here), the current results (here), and the charts and tables (here) . So What’s the Mood in Farm Country? The first results of the Ag Economy Barometer were released on May 3rd and reflect conditions as of April 2016. When looking at the survey results it is important to understand that the attitudes are relative to those of the base period which is March 2015 to October 2015. The index is centered on 100 and created by subtracting the percent of respondents with unfavorable views from those favorable views and adding 100. For example, if 30% are neutral, 20% are favorable, and 50% unfavorable, the index would stand at 70 (20% – 50% + 100% = 70). This type of index is sometimes called a diffusion index and is similar in construction to those used by the Kansas City Fed’s report of credit conditions (see chart 2 in this report for example). The barometer is slightly different because it summarizes the results of 5 questions and is then normalized by dividing by the average value in the base period. Anytime that you see a value under 100 producers are viewing the current situation more negatively than in the base period. When the value is over 100 the opposite is true. The April reading of the barometer was 106, meaning that sentiment had improved over the base period, but what is interesting is the trajectory of the results. The readings from October 2015 to today are shown in Figure 1. Here, one can see that the attitudes I noticed earlier were real. Sentiment was falling rapidly from January to March when it bottomed out. The April reading shows that sentiment improved back to levels at the end of 2015. Figure 1. 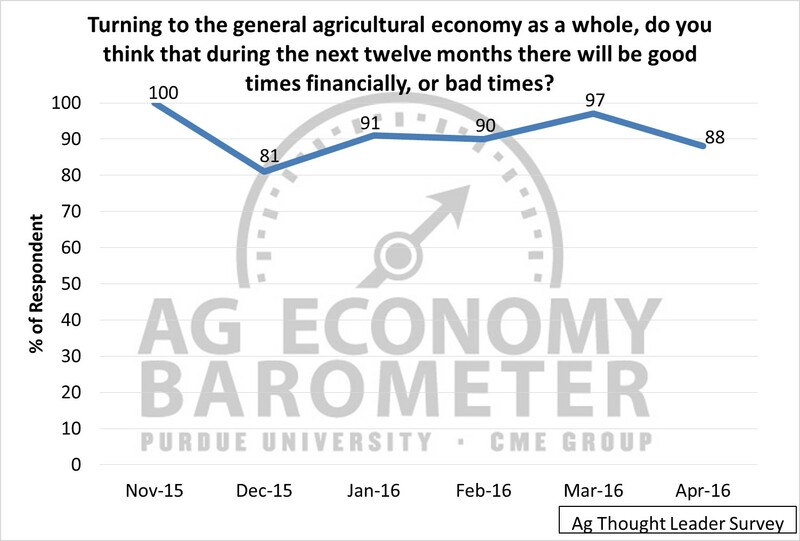 The Monthly Purdue-CME Group Ag Economy Barometer, October 2015 to April 2016. Source: Purdue-CME Group Ag Economy Barometer. Overall, it seems that the attitude in the sector is improving, but it is important to remember that 1) the comparison is against a time when attitudes were probably not overly favorable (March 2015 to October 2015, 2) we still aren’t back to even those levels, and 3) sentiment can change rather rapidly. Some of the other data reported in the project help underscore these ideas. The results I found most interesting were from the question about whether the next 12 months would bring good or bad times financially in the agricultural economy. This is shown in Figure 2. Here, you can see that the overwhelming majority (76%) expected that the next 12 months would bring bad times. To me, this is an example of the extremely negative overall sentiment in the sector. It is difficult to get people to agree on most issues, but here there is a pretty strong consensus. Almost all of the respondents expected bad times ahead in the next 12 months. Figure 2. Percent of Respondents Expecting Bad Financial Times in the Next 12 Months. Source: Purdue-CME Group Ag Economy Barometer. Perhaps even more interesting, the farmer attitudes are rosy compared to the survey of 100 thought leaders (Figure 3), of whom 88% expected bad financial times in the next 12 months. The thought leader expectation index is actually less negative that at the start of the data when 100% expected bad times. On the other hand, producer sentiment on that question has actually gotten more negative from the start of the project. While improvement in the overall barometer is encouraging, it is clear that there is a long way to go until attitudes about financial conditions get back to levels that most would consider positive. Figure 3. Percent of Respondents in Thought Leader Survey that Expect Bad Financial Times in the Next 12 Months. Source: Purdue-CME Group Ag Economy Barometer. What are Other Sentiment Indicators Showing? As was mentioned earlier, the Kansas City Federal Reserve Bank, as well as other regional Federal Reserve Banks track attitudes toward credit conditions using a similar style of diffusion index. 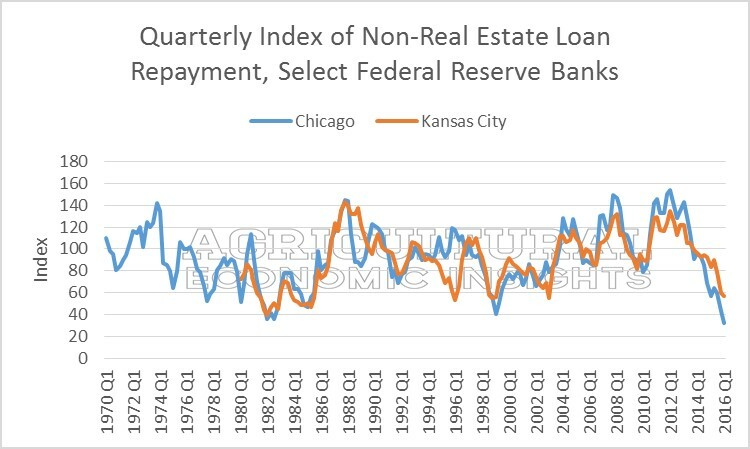 Here, we will examine the diffusion indexes for repayment rates on non-real estate loans reported by the Kansas City and Chicago Federal Reserve Banks. These indexes are calculated by subtracting the percentage of bankers that responded that repayment rates were “lower” from the percent that responded that repayment rates were “higher” than in the previous year quarter and adding 100. The results for the Kansas City and Chicago Fed districts were released in the May 12, 2016 Quarterly Survey of Agricultural Credit Conditions and are shown in Figure 4 with Chicago in blue and Kansas City in orange. Keep in mind this is a slightly different diffusion index, it is not normalized to a base period, rather the results show the gross values of the index. Figure 4. Quarterly Index of Banker Expectations of Repayment Rates on Non-Real Estate Farm Loans, 1970-2016. Source: Federal Reserve Banks of Kansas City and Chicago. Pretty negative sentiment indeed. If you want to read some of the comments offered by respondents to the Kansas City survey you can find them here and their analysis of the situation is here. While producer attitudes seemed to improve slightly in recent months, the sentiment in the agricultural sector continues to be quite low. Most respondents in the Purdue-CME survey expect difficult financial times in the coming twelve months. Ag lender sentiment also seems to point to continuing difficulty. With commodity prices showing slight increases it is likely that ag producer sentiment might continue to improve. The only problem is that it has a long way to go until conditions in the sector start to feel like they are worthy of more optimistic views. The next reading of the Ag Economy Barometer and survey comes this week likely shed some light on this issue.